The other evening, for the want of anything more dramatically interesting, we were about to watch a comedy film on tv, Raising Arizona with Nicholas Cage and Holly Hunter, about a couple who steal a baby, when Anita asked me what it was about. I said it sounded as if it would be very similar to Simple. one of her books. As Anita’s editor, it was no surprise to me that it was still in my head. I had read, edited and formatted that book extensively, as I have with all of her books and can practically recite them all verbatim. Raising Arizona was meant to be a comedy, but was disapointing. I thought I could watch anything that starred Nicholas Cage, but I was wrong and it got me thinking. By comparison, Anita’s book Simple couldn’t be more different if it tried. Dramatic, sad and full of the nastiness that human beings inflict on one another, especially a mentally challenged man/child like Simple. Not quite as violent and brutal as its forerunner, Bad Moon, but if it was a film, I would wear out the tape in no time! I had been walking for so long my legs were slowing down, beginning to stiffen. It would be light in a few hours and still no sign of Simple. I saw the ridge up ahead in silhouette against the night sky and made myself walk a bit further. Looking down from the top of the ridge, I could see a few lights twinkling on the outskirts of town and the faint gleam of the river that ran down the mountain. I sat and rested my legs, enjoying the cool night air on my damp skin. Then I heard a sound, something was moving about in the darkness behind me. I hid behind a rock, hoping whatever it was wasn’t bigger than me, wishing I had brought Jack’s rifle along. My heart didn’t slow down, even when I saw it was Simple coming out from wherever he had been hiding. He was carrying something wrapped in a blanket, holding it close to his chest, tight, like he was afraid he would drop it. I stepped out from behind the rock and startled him. At the sight of me, he froze, only his eyes moving frantically from side to side. He didn’t answer me and sat down on a fallen tree. It was my turn to be startled when the blanket he held moved all by itself. Knowing him as I did, I expected a wounded animal, but I was wrong. He unwrapped the blanket and held up a baby, not a year old. Its white skin gleamed luminous in the pale moonlight and I could see it was a little boy. I didn’t know what to think. Simple had been gone for weeks and I had missed him so much. What on earth did he think he was doing? I sat staring at the baby, its tiny head swallowed up in his huge hand, so filthy against the clean skin. He couldn’t have had him for long. This was going to take the rest of the night. I had to make him see, to understand we had to take it back before half the town came looking for it. He kept trying to say they had plenty of babies in town. ‘Lizzie’s die. Lizzie can’t make a g-good baby.’ He wrapped the blanket around the baby, holding him so tight I feared he might crush the life out of him. I suddenly realised that the baby hadn’t made a sound, so I looked closer to see if he was still alive. Seeming to sense my presence, his eyes flicked open, a gleaming deep blue in the pale moonlight. I asked Simple if he remembered where he took the baby from. ‘Town,’ he said. ‘Like b-baby long time.’ He looked funny as if he was trying to remember something. I couldn’t understand what he meant. I still didn’t understand, but I couldn’t think about Simple’s words, I needed to get this baby back where it belonged, and quick. I would ask Gran later what Simple was on about. I told him I knew the baby came from town. I followed him to the edge of the woods, close to town. Dawn was starting to break in the east, a gradual reminder that daylight would soon give us away. Creeping behind a row of whitewashed houses, Simple stopped beside an open window. I held my breath as I watched him climb in and put the baby back from where he had taken it. They were written long before the world of Indie publishing, so we approached traditional publishers with the help of a well-known literary agent. They all said the same thing, that they were impressed with the strong powerful writing, and that they were well written, but they wouldn’t fit with all the other books on their list. I can appreciate this now, as finding the right category has been hard. If only those publishers had the courage of their convictions and made room for us! I was a lonely child, and London was a lonely place to be when I was growing up there after the war. All around me, people were busily trying to put their lives and homes back into some kind of order. I remember walking around the streets, confused by all the chaos that still had to be dealt with, all the piles of dusty bricks and rubble that was all that remained of so many people’s lives. This is probably what made me such a melancholic child, and the reason I retreated into the world of books. I often wonder if my memory is at fault. Was this book really illustrated, or did the words simply conjure up what I thought I saw? I do love a good book and I must have read thousands of them in my lifetime. This brings me rather neatly to my favourite author of all time, Stephen King. He wrote about everything from a crazy car to a tormented child and just about every scary subject in between. I have spent so much time in his company. Which brings me to another of my favourite authors. Anita Dawes. You meet her here quite regularly, as she is the other half of this writing partnership. Not quite getting the recognition I think she deserves, but I can see a similarity with King in everything she writes. Horrible things happen to her characters too, but you cannot help but love them anyway. “Watching the truck coming towards us seemed to take forever, like Pa was going deliberately slow. We waited for Pa to get out of the truck and I could see from his dirt-streaked face that it weren’t good. Nathan’s face looked worse. But I had to see for myself, had to know if it was the tree falling on him that had killed him. My eyes were wet, but the tears wouldn’t fall. I pulled the shirt back and a scream tore at my throat, trying to find a way out. No sound came as I looked at what was left of his face, dark gaping holes looked back at me. Gone were his blue grey eyes, the very thing I had liked most about him had been gouged away. His face was torn and bloody. Dried blood matted his hair and dead leaves were sticking to him. Nathan tried to take me away, saying I had seen enough. I felt myself being lifted slowly from my knees and as Nathan carried me away, that’s when my mind registered what it had seen. The torn flesh on his face hadn’t been caused by the fall. The skin standing away from the bone and all the dried blood made it hard to read, that was why my mind didn’t see it right off. They had cut Pa’s name down one side of his face, as if taking his eyes weren’t enough. If you want to read more of this incredible book, simply subscribe to our blog, leave a comment and win a free copy. I remember walking around the streets, confused by all the chaos that still had to be dealt with. All the piles of dusty bricks and rubble, all that remained of so many people’s lives might be what made me such a melancholic child, and the reason I retreated into the world of books. I do love a good book and I must have read thousands of them in my lifetime. One of my favourite authors of all time is Stephen King. He wrote about everything, from a crazy car to a tormented child and just about every scary subject in between. I have spent so much time in his company. Which brings me to one of my favourite authors, Anita Dawes. You meet her here most weeks as she shares this site with me, and she is not yet getting the recognition I think she deserves. I can see a similarity with Stephen King in everything she writes, for horrible things happen to her characters too, but you can’t help but love them anyway. “Watching the truck coming towards us seemed to take forever, like Pa was going deliberately slow. We waited for Pa to get out of the truck and I could see from his dirt streaked face that it weren’t good. Nathan’s face looked worse. No sound came as I looked at what was left of his face, dark gaping holes looked back at me. Gone were his blue grey eyes, the very thing I had like most about him had been gouged away. I remember walking around the streets, confused by all the chaos that still had to be dealt with. All the piles of dusty bricks and rubble, all that remained of so many people’s lives. This could be what made me such a melancholic child, and the reason I retreated into the world of books. I do love a good book and I must have read thousands of them in my lifetime. Which brings me rather neatly to my favourite author of all time, Stephen King. (see above) He wrote about everything, from a crazy car to a tormented child and just about every scary subject in between. I have spent so much time in his company. “Watching the truck coming towards us seemed to take forever like Pa was going deliberately slow. We waited for Pa to get out of the truck and I could see from his dirt streaked face that it weren’t good. Nathan’s face looked worse. No sound came as I looked at what was left of his face, dark gaping holes looked back at me. Gone were his blue-grey eyes, the very thing I had like most about him had been gouged away. His face was torn and bloody. Dried blood matted his hair and dead leaves were sticking to his face. They had cut Pa’s name down one side of his face as if taking his eyes weren’t enough. Ps… Have you entered the Goodreads Giveaway for a signed paperback copy of ‘Secrets’ yet? Just click on the box on the right side of blog! Every friday, we are going to be showcasing one of our books, with the opportunity for five lucky readers to receive a free kindle copy of the featured book. Over the years, Annie has come to terms with her mother’s endless stream of lovers, her father’s infinite love and patience, and her weird brother. 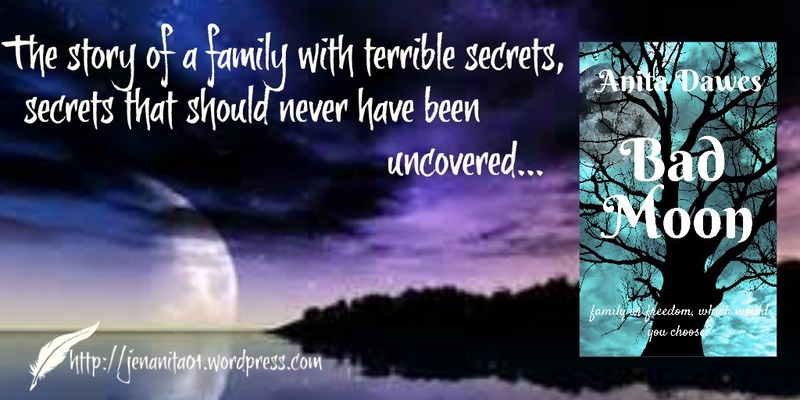 But when rumours start about men missing from town and her father’s behaviour changes for the worse, she has a sudden desperate need to know the truth about the strange carvings that Pa does secretly in the barn. If she finds out that the rumours are true and does nothing, she knows she will be destined to carry on what seems to be a family tradition. Bad Moon Rising is a powerful story about a young girls fight to create a better life; one of fear and brutality; the paradox of blood-stained innocence and the struggle for freedom. Blood Ties and an Unforgiving Fate.